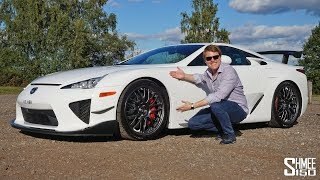 The Lexus LFA 2012 is exclusively powered by a sophisticated new high-revving 4.8-liter V10 engine that generates 552 horsepower at 8,700 rpm and 354 lb.-ft. of peak torque at 6,800 rpm. The engine is mated to a unique six-speed Automated Sequential Gearbox (ASG) with paddle shifters that enables ultra-quick gear shifts (0.2 seconds) with four driving modes – AUTO, SPORT, NORMAL and WET for exceptional versatility. Lexus supercar LFA accelerates from 0 to 60 in 3.6 seconds and achieves a maximum speed of 202 mph thanks to an independently controlled throttle body for each cylinder, high-volume 12-hole injectors, dual Variable Valve Timing with intelligence (VVT-i), low-friction engine components, and equal length exhaust manifolds. Lightweight, powerful and balanced, the LFA features advanced Carbon Fiber Reinforced Plastic (CFRP) construction for its chassis and bodywork to deliver a light, incredibly strong and impact-resistant structure. Lexus today announced the Manufacturer’s Suggested Retail Price (MSRP) of $375,000 for the all-new 2012 LFA supercar. The MSRP does not include a delivery, processing and handling fee. LFA, the flagship for the F portfolio of Lexus performance models is the fastest Lexus production car ever built and delivers world-class design, performance, and cutting-edge technology. The LFA is only available as a two-year lease with the intent to purchase. Only 500 LFA will be built worldwide. “The LFA has more passion and character than any Lexus built and we’re excited that we’re finally able to give U.S. customers official pricing,” said Mark Templin, Lexus group vice president and general manager. Configuration 1 – Leather or Alcantara®-trimmed seats. Configuration 2 – Leather or Alcantara-trimmed seats, Lexus Navigation System and Mark Levinson Premium Surround Sound system. Configuration 3 – Leather or Alcantara-trimmed seats, Lexus Navigation System, Mark Levinson Premium Surround Sound system, and Lexus Enform™ with Safety Connect™. Customers will be able to customize the LFA with 30 exterior colors, six brake caliper colors, and 12 interior colors. Some choices carry an additional cost. 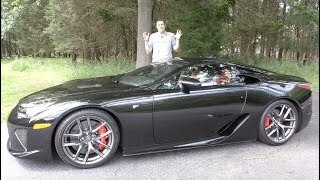 The Lexus LFA is exclusively powered by a sophisticated new high-revving 4.8-liter V10 engine that generates 552 horsepower at 8,700 rpm and 354 lb.-ft. of peak torque at 6,800 rpm. The engine is mated to a unique six-speed Automated Sequential Gearbox (ASG) with paddle shifters that enables ultra-quick gear shifts (0.2 seconds) with four driving modes – AUTO, SPORT, NORMAL and WET for exceptional versatility. Lexus’ supercar accelerates from 0 to 60 in 3.6 seconds and achieves a maximum speed of 202 mph thanks to an independently controlled throttle body for each cylinder, high-volume 12-hole injectors, dual Variable Valve Timing with intelligence (VVT-i), low-friction engine components, and equal length exhaust manifolds. Lightweight, powerful and balanced, the LFA features advanced Carbon Fiber Reinforced Plastic (CFRP) construction for its chassis and bodywork to deliver a light, incredibly strong and impact-resistant structure. To help provide superior handling and braking and traction control the LFA features track-tuned lightweight aluminum alloy suspension components; six-piston front and four-piston rear calipers to grip the Carbon Ceramic Material (CCM) brake rotors; and a specially calibrated Vehicle Dynamics Integrated Management (VDIM) system. The low-slung LFA exudes supercar styling with Lexus design philosophy in one cohesive form. Its clean, muscular and athletic design is complemented by extraordinary aerodynamics for optimal drivetrain cooling and superb high-speed handling. Its incredible exhaust note is possible by the multi-stage exhaust system that exits through a stacked trio of exhaust outlets. The LFA’s exterior styling is further enhanced with BBS® 20-inch forged-aluminum 10-spoke wheels available in three different finishes. “After years of development, Lexus is able to offer driving enthusiasts an exciting and exclusive combination of performance and luxury in a sleek supercar package. It’s thrilling to know that in about a year, you just might see one driving down the street,” said Templin.